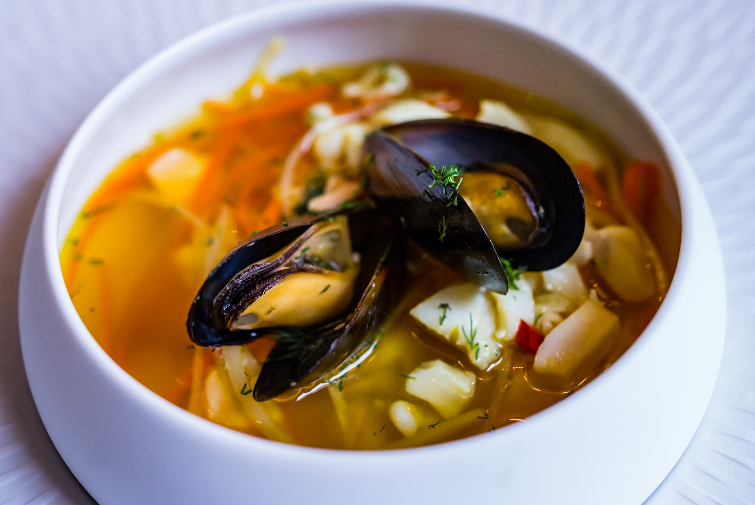 Papieroovka Restaurant at Sadova Hotel presents recipe for delicious soup with seafood. Wash and peel all the vegetables. Julienne the carrots, parsley root and celery, chopping the celery stem finely. Braise the vegetables in a pot with butter, and add the white wine. Once the vegetables are slightly braised, add the fish broth. Heat and simmer. Remove the scales from the salmon and the cod, and cut into 1 cm x 1 cm dice. Remove the skin from the calamari and cut them into rings. Fry all the fish using butter and then add to the soup. Rinse the calamari and mussels, then add them to the soup as well. Season with salt, pepper, soaked saffron and chopped dill. Add a few drops of the amber liqueur before serving the soup.